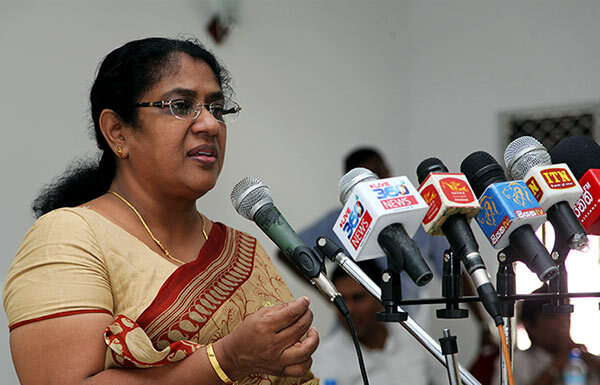 Foreign Employment Minister Thalatha Atukorale has regretted the failure on the part of the government to have former President Mahinda Rajapaksa investigated through the Financial Crimes Investigation Division (FCID) for spending Rs 400 mn on a monument in memory of his parents put up in Tangalle. Addressing a public gathering at Piyagama in the Balapitiya electorate on June 23, Minister Atukorale said the former President had constructed the monument in a plot of land not belonging to him. She said that her cabinet colleagues were also concerned about the FCID not inquiring into public funds spent on a private matter. Minister Atukorale said that she wanted the former President probed by the FCID. The FCID and the CID and whoever, should probe into the affairs of the previous oligarchy and not only to bring the culprits to book but also pursue recovery of all lost wealth. Unfortunately, your ‘spineless’ leader who is heavily obliged to the R’s for his own survival, will not pursue the R family corruption. Your leader thinks he is a political mastermind; but he is not considering what’s happening in the World. First, in Canada, there is Justin Trudeau; second, in France there is Emmanuel Macron; this is the way the World is going; young, visionary leaders who empathise with the younger as well as the older generations. I find Macron alliancing with Arnold Schwarzenegger; that is the way to go. The UNP is a forward looking party; I cannot understand the younger generation following the ways of dinosaurs like RW, Kiriella, Amaratunge, Jayasundara, Sajith and Ruwan and Senasinghe. These dinosaurs are outdated and are only fit for the Museum!! C’mon Thalatha, you are young and able, new with fresh ideas and courage, lead the way and we will follow you. Go for it, dear lady, as said by sister Kneeranjala !!! Good you brought this up Thalatha. I really appreciate. Are we forgetting about Bandaranayake Memorial in Aththanagalla? It too came from state funds isn’t it?